A scientific study published in the journal Global Change Biology suggests snoek (Thyrsites atun) can recolonize the marine area of the Beagle Channel and South-Western Atlantic waters, an area in the American continent where this species competed with the hake (Merluccius sp.) to hunt preys in warmer periods. The conclusions open new possibilities regarding the prediction of potential changes that can affect trophic networks in this marine region, where the hake is a key species, due the effect of rising ocean temperatures caused by climate change. This will benefit commercial fisheries. The new study is part of the ongoing doctoral thesis by the researcher Maria Bas, member of the Austral Center for Scientific Research (CADIC-CONICET, Argentina) and the Biodiversity Research Institute (IRBio) of the University of Barcelona, co-supervised by the lecturer Lluís Cardona. The snoek is a pelagic species from the family of Gempylidae, common in deep waters in the austral areas in South America, Africa, Australia and New Zealand. This species was exploited for about 6,000 years by aboriginal hunter-gatherers of the area in the Beagle Channel, a tectonic bay that connects the Pacific and the Atlantic oceans in the southern area of South America, in subantarctic latitudes. However, the fish disappeared in the area during the period known as Little Ice Age, a period of cooling dating from the late Middle Age until the 18th century. According to the study, the potential temperature rise in the area could allow the snoek to recolonize from the coasts in Chile, an area where the species is abundant, to the Beagle Channel and the Southern Western Atlantic. This would have a negative impact on the population of the hake, its fishing and the regional economy, because although the snoek is a species of fishing interest, its economic value is lower than the hake's. The study, now published in the journal Global Change Biology, compares the current structure of the trophic network in the Beagle Channel to the one from the past, when temperatures were higher. To do so, experts analysed zooarcgaeological remains of marine fauna which were found in Tierra del Fuego (Argentina) in sites of hunter-gatherer and fisher populations, who lived in the region about 10,000 years ago. The records come from the archaeological site of Lanashuaia-II, located in the Beagle Channel, dated approximately 1,300 years AP (late Holocene, a warmer period than the current one). 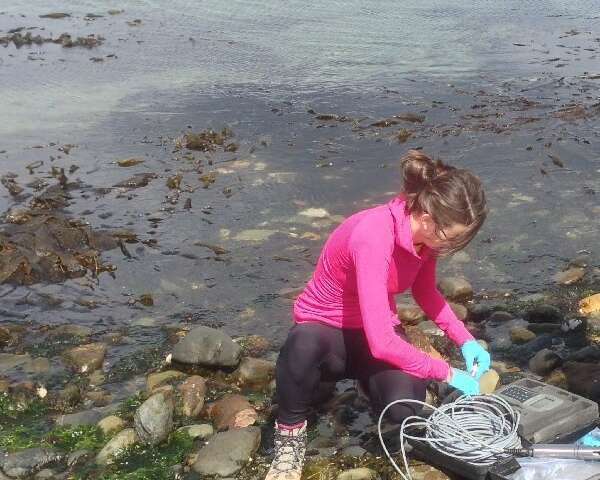 The experts analysed the stable carbon and nitrogen isotopes in bone samples of ancient and modern marine species in the Beagle Channel. The objective was to compare the structure of the trophic networks of the late and modern Holocene and predict potential changes caused by the rise of temperatures in shallow waters in the region. They also conducted complementary isotopic analyses on the shells of ancient and modern molluscs to explore the changes in the basal isotopic line and therefore compare the evolution of marine trophic networks over time. The study also reveals the introduction of salmonids in rivers has altered the diet of imperial shags (Phalacrocorax atriceps), a species which is currently strictly marine in the region, but in the past it depended on native fish that migrated between rivers and estuaries to breed.